Vicky first learned to prepare this Pennsylvania German treat with her grandmother. The pig stomach is cleaned and soaked in salt water overnight. Then, she cubes potatoes and removes the casing from the sausage (always from Peters Brothers Meat Market in Lenhartsville), mixing both with salt, pepper, and parsley. She stuffs the pig stomach with the mixture and sews it shut with a special sewing needle, which belonged to her great grandmother. The stuffed stomach is baked for about 3 hours at 350 degrees in a special roasting pan. As you can see from the photo, the roasting pan is well worn because it is the same roasting pan her grandmother used to make pig stomach. 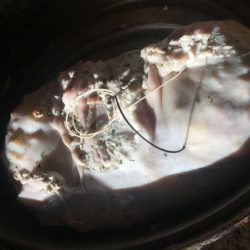 A perfect pig stomach is one that does not break open while cooking. Once cooked, the pig stomach is sliced and served. Vicky says the dish tastes best with corn and cole slaw. You can almost imagine as she prepares this traditonal Pennsylvania German meal, with all the knowledge and materials passed down to her from the previous generation, Vicky’s grandmothers, standing right there beside her in the kitchen as she carefully stitches up the pig stomach with her special sewing needle and roasting pan. You can imagine them smiling as she serves this meal to her children and they taste the same comforting flavors that their great-great-grandparents once enjoyed. This is the power of foodways. Our stories, our family history, our hertiage can all be told through the food we eat. Just one bite can connect us to our past. This year, the Berks History Center will explore this compelling human experience. According to the Merriam-Webster dictionary, foodways are the “eating habits and culinary practices of a people, region, or historical period.” As we delve into this topic, we will focus on the foodways that are important to the people of Berks County. We will do so through themed programming, including Second Saturday programs and the Berks History Conference, as well online communications. We will share our local foodway stories, including stories from BHC staff, here on our blog, NewsBits (the BHC newsletter) and social media ( Follow @berkshistory). We hope that you will share your stories too. Send us photos, recipies, and information about your traditional family foodways by participating in the #MyBerksHistory project or email us at publicity@berkshistory.org. We want to share as many stories about Berks County’s history as we can! Stay tuned!